You never know how brutal and gory Stephen King might get (well, if you read him, you know), but I have to give Joyland a hearty thumbs up for an entertaining summer read. King’s paperback pulp-style (look at the cover) novel centers on a narrator just getting over having his heart broken for the first time who ends up joining an aging amusement park in North Carolina for the summer. The story spins around Devon Jones (the narrator) coming to terms with life, a ghost story that leads to a murder investigation, and odd connections that Devin makes during the summer and beyond. King is fairly restrained here, slowly building the suspense of a mystery underway, and it works. Joyland is a joy to read, and as part of a Hard Case Crime series of books, it is both a detective novel and a foray into the unknown (King territory) as one or two characters have the “gift” of vision beyond reality. These visions help Dev solve the case of a murdered girl, almost too late for his own good. More importantly, King immerses the reader in the language and behind-the-scenes views of the carnival life, complete with the Talk (the ways in which carnies communicate with each other in a sort of code). That kind of attention to detail gives the story a real hook, and allows King to use his considerable writing talents to the benefit of character development and story. 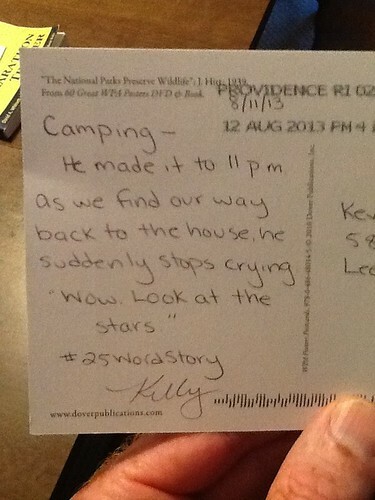 I love this idea that my friend, Kelly, had about taking the idea of the #25wordstory format from Twitter and moving it into a postcard project. She offered to send anyone who asked a 25 word story on the back of a postcard from her vacation spot, and I eagerly took her up on the offer. A few days later, this fantastic story arrived in my mailbox. Just as 25 word stories are a perfect fit for Twitter, so too is it a perfect fit for the back of a postcard. Way to go, Snail Mail! When I was a music major in college (yep, for one year), all roads in our jazz music history class rightly went through the life story of Satchmo, or Louis Armstrong. While there were many before him (Sidney Bechet, for example) who nurtured the concept of jazz before it became mainstream, it was Armstrong nearly alone who rode the wave of popularity of jazz and gave it both an inventive and popular culture twist — in concerts, on records, in movies. This graphic novel biography — Louis Armstrong: Jazz Legend — tells a condensed life story of the legendary Armstrong, from his roots in one of the toughest neighborhoods in New Orleans where some gun play lands him in a youth detention center where he first learns to play music, to his scramble to find enough coins to buy his first horn, to his band work with renowned leader Big Joe Oliver, to singing Hello Dolly as a surprise hit (he didn’t like the song all that much and sang it as a toss-away song) on the big screen. The narrative tone of this graphic novel (aimed at elementary students) is Armstrong’s own voice, told through a short history he wrote while recuperating in a hospital bed. 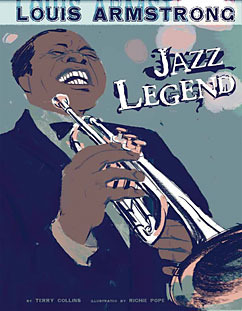 The pace of the book is quick, moving from one event to another like a riff, and as always with Capstone Press graphic books, there is a solid glossary at the back with musical terminology and a text version of Armstrong’s life, as well as some additional website links that readers can follow to learn more about Satchmo (called that because he had a large mouth and was nicknamed Satchel Mouth, before shortened to Satchmo) and his impact on popular music and jazz. I wasn’t all that keen on the illustrations in this book, but I get that the artist was trying to capture the free jazz style of Armstrong in the drawings. I found them a bit too rudimentary, and green-washed, for my own liking. 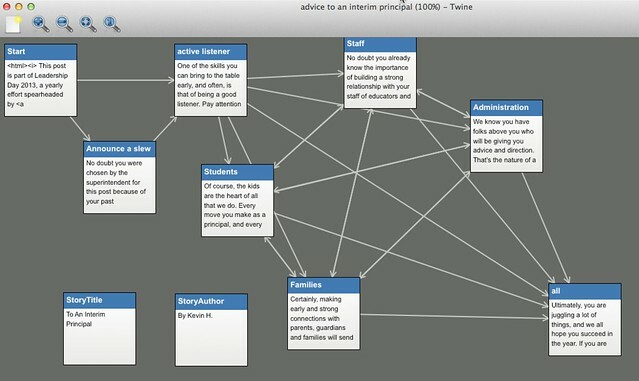 This year, I am using Twine to create a “choose your path” story for an interim administrator. Although Scott has many possible prompts around technology and learning, I did not focus on that this year. Instead, I focused on leadership in general. We have an interim principal this coming year, and that must be a difficult job to come into, particularly when you are following in the heels of a longtime administrator who made his mark on our school. I wish our new interim principal well, and hope she is an active listener. She has already reached out to me about technology and learning, so I will take that as a positive sign. This is what my story looks like “behind the curtain,” so to speak. I still have not found a regular use for Pinterest in my information life, but this growing collection of resources for teachers might be something useful for folks. Pinterest has created this “hub” of pins around teaching, grouped by grades and topics and more, and there are some good resources here. I am following the sixth grade board, just to see how it develops. The founders of YouTube have put out a new video tool called MixBit, which is sort of like Vine and the Instagram video tool but with the twist of remixing. I’m still figuring it out, but here is a video of my dog on the floor. What the site does is divide up your video into segments, and allows you to remix the video in other ways (or use segments from other people’s videos, which is interesting and worth investigating). Here, I remixed some of my dog with some other dogs and cats on the site. 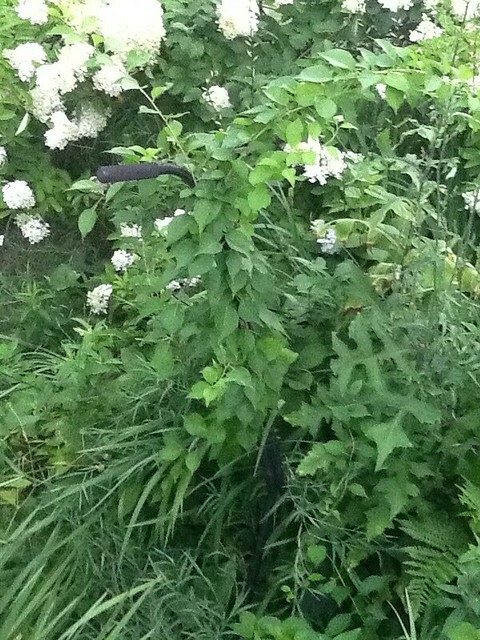 You know when something is new and you are still figuring out the possibilities? That’s where I’m at with MixBit right now. PS — Firefox does not yet play nice but Chrome works fine. I really like Max Barry’s Lexicon, so I wandered back to this earlier novel, Jennifer Government. I wanted to like it. I did. But I didn’t. It felt as if I were reading a screenplay, not a novel, and when I looked at the publication date, it reminded me of how we need to time for writers to find their voice and vision. So, yes to Lexicon but no to Jennifer Government. The premise is interesting — the story is set in some not-too-distant future where two business conglomerates are basically running the world, with the government (the United States has taken over a few countries) running a distant third in terms of power. Here’s the thing– I wanted to like this book, and I wanted to like the character of Jennifer Government. But it felt as if Barry never gave me the chance to like either. Just as I would be settling in, the plot would shift and move. Like I said, this felt more like a screenplay than a novel. I’m just grateful he has found his voice as a writer now. Lexicon is worth your time. It will make you think and engages you on a few levels. Jennifer Government — not so much. It will make you want to take a break from the book. That’s never a good thing.